There was a time when using the same fabric for the curtains, the sofa cushions or even the sofa itself was not uncommon. Nowadays, this deco idea is totally out of date. However, it is still very possible to match your curtains with your furniture in a modern fashion. Some people give in to a certain curtain envy for their windows, then later choose their furnishings, just because financially speaking, the curtains are the more immediately accessible option. They then try to match the style of the furniture with that of the curtains in place. You may want to proceed the other way around by furnishing first, then choosing curtains as a final touch to the decoration. Dressing your windows should come last: they won’t take centre stage, and should you decide to change up your interiors a bit, changing curtains will be much easier than changing all your furniture! The choice of curtains can be done after wall painting and furniture placement, and at the same time as other decoration elements such as a rug, cushions or throws… For example, if you chose furniture that is neutral and light, like white varnished pieces and if the room has natural walls, like pearl grey or beige, you can create a very zen atmosphere by following that line. To do so, choose light veiling or curtains in a light and natural fabric such as linen. Assorted with the furniture, these will perfectly blend in with the decor. You will get a modern, fresh and enjoyable ambiance. The windows’ curtains finish off the decoration of a room, in order to obtain a warm atmosphere. They can allow you to create a contrast between the furniture and the decoration of the space. For example, if you furniture is dark, like wenge wood, you can go for completely opposite shades for your curtains, and even other decoration accessories. 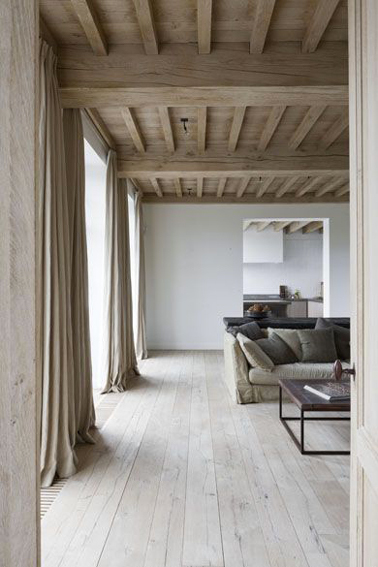 To do so, you can for example choose natural coloured linen curtains, or beige or white cotton curtains. If you want to create a very dynamic ambiance with a pop feel, pick coloured curtains in contrast with, for example, white furniture. In this style, string curtains with bright colours are a very good choice. Choose a colour, then decline it on other accessories. However, the colour must be repeated here and there, but white has to remain predominant for a harmonious result in the room.